We have a private pilates studio with two reformers, a cadillac, a trap table, a chair, a ladder barrel, and super quality instructors. And we are located in an easy to access location in Santa Monica at 15th and Broadway. Our current excellent pilates instructors are Rafael Garcia and Victoria Ganim and they are incredibly well trained. Dr. Weitz oversees the program and is involved with exercise selection and modification for each client’s unique needs. We have named our pilates program, Chirolates, since we incorporate the chiropractic principles of alignment, postural correction, and mobilization. 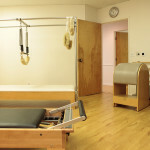 Our pilates program offers either individualized exercise programs for people desiring a higher level of fitness or Therapeutic Pilates for injuries ranging from minor to more serious conditions and rehabilitation after surgery. Pilates is an exercise system with over 500 exercises which focus on the development of the stabilizing, core musculature. The deep abdominal and low-back muscles and buttocks are strengthened, thereby creating a solid foundation, reducing stress on the spine and the weight bearing joints. The end result is toned, functional muscles, increased strength, improved balance, and a more efficient body. You will learn how to find your neutral spine position and how to recruit your deep, stabilizing muscles. Even if you go to the gym and exercise regularly, adding a pilates session per week will round out your fitness program. And our instructors can help you to get stronger and improve your spinal stability for golf, tennis, and other activities. We now offer a Golf Pilates program specifically designed to improve your body so that you can more effectively swing a golf club. Improve your most important piece of golf equipment–your body. Our master trainer is the awesome Rafael Garcia! Rafael is simply the best pilates instructor with the ability to fine tune the routine and movements to help you strengthen what is weak, stretch what is short and tight, and overcome imbalances that have contributed to your pain and reduced function. Rafael started as a dancer and received three separate scholarships – early recognition of his talent, discipline and devotion to the art. He quickly became an in-demand dancer and then choreographer whose work was seen in film, TV, commercials, music video, and stage. 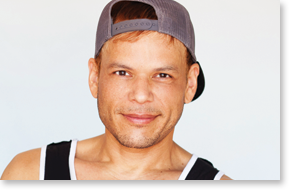 Always desiring to go deeper in his understanding of bodies and movement, Rafael became a certified Pilates instructor through his mentors Bill and Jaqui Landrum, acclaimed Pilates and Gyrotonics Masters. He soon became as much in demand as a teacher as he was as a dancer. His clients have ranged from celebrities, to the elite dancer, and the critically injured. His training, his experience, and keen instinct have gifted him in knowing what a client needs in order to excel in his or her physical journey. His talents have allowed him the opportunity to work with Pilates pioneer Mari Winsor and manage her “Winsor West Pilates” location. He has also been head instructor, teacher trainer, and creator of the group Reformer program at Gold’s Gym Hollywood, Downtown LA, and Thousand Oaks where he also created a teachers certification program. He has lead dozens of workshops and even incorporated Pilates the dance program at the University of Southern California. Rafael is devoted to the idea of bringing the healing knowledge of Pilates to as many students and teachers as possible, knowing the life-enhancing power of the Pilates technique and method. He is in demand and he has quickly built up a busy practice. 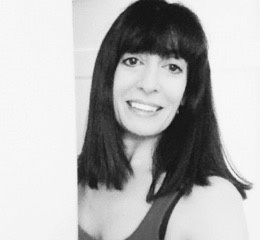 Victoria is very passionate about pilates and helping clients to reduce pain through strengthening and awareness of proper body alignment in movement. She enjoys working with clients one on one to improve efficiency and freedom of movement. She is a great teacher and she has developed a very loyal clientele at Weitz Sports Chiropractic and Nutrition. Victoria was trained through the Long Beach Dance Conditioning program and she also trained in ballet in London and Zurich. Make an appointment and give our pilates program a try! We currently have openings for new clients. Our fees are reasonable: only $80 per session or $75 each if you buy a package of 10 sessions. Couples training will be 1.5X the price or $120 for two people exercising at the same time.